The St. Louis-San Francisco Railway, Ship it on the Frisco! The St. Louis-San Francisco Railway, commonly known as the "Frisco," has a storied history of two halves. During its first 60 years the company struggled mightily with a tumultuous history of name changes and bankruptcies. It tried many times to create a transcontinental corridor but failed in every attempt. The much larger Atchison, Topeka & Santa Fe was predominantly responsible for this setback as it sought its own route to the coast. 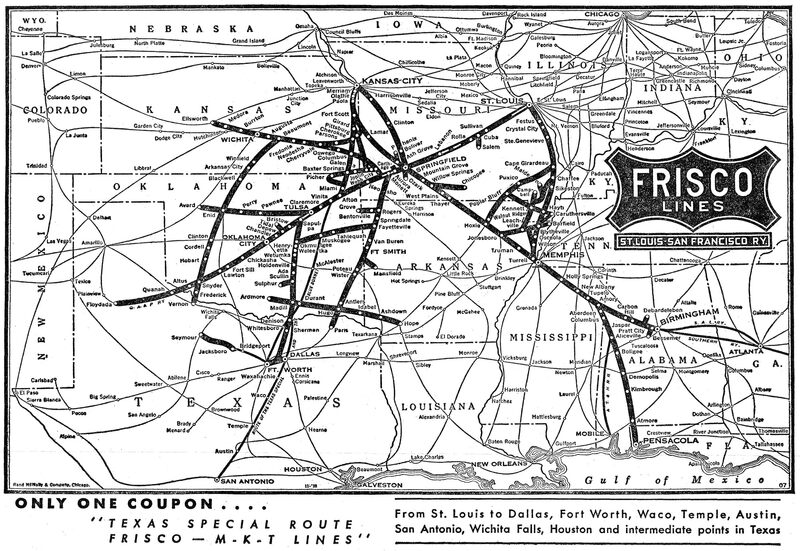 After settling into a regional role serving parts of Kansas, Missouri, Texas, Oklahoma, Arkansas, Mississippi, Tennessee, and Alabama the Frisco blossomed into a successful railroad. Its status was further enhanced by reaching the Gulf Coast (Florida) during the 1920s where the lucrative petrochemical industry later developed. Following one last bankruptcy, brought about by the depression, it spent the last 30 years as a healthy carrier. Throughout its corporate history the Frisco was not your typical Midwestern "granger" system as it carried a culture all its own, right down to a self-designed coonskin logo. 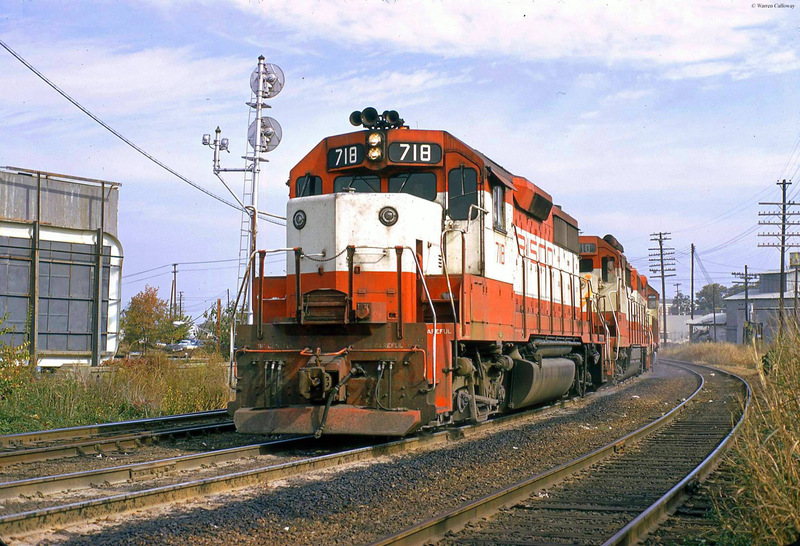 Both its own prosperity and the merger movement were growing during the 1970s, which led to its acquisition by western giant Burlington Northern in 1981. The St. Louis-San Francisco Railway's story begins in Mach of 1849 when the Pacific Railroad (PR) was chartered by the State of Missouri for the purpose of linking St. Louis with the Pacific coast. The transcontinental concept was an aspiring but daunting one given that no railroad had yet accomplished such a feat (and ultimately would not for another two decades). Nevertheless, the project pressed forward and by July of 1853 the first 38 miles to Franklin, Missouri (now known as Pacific) was finished. Alas, like so many grand schemes it became extremely difficult maintaining the needed cashflow and before long the PR ran out of money. 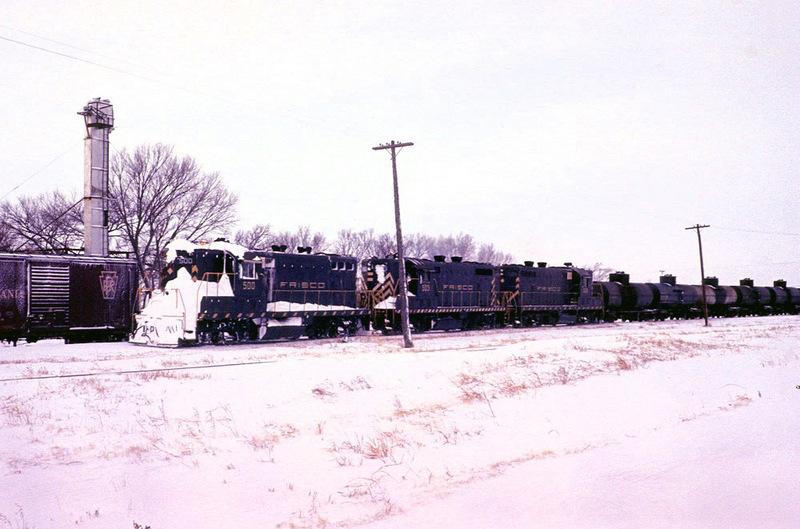 In his book, "Classic American Railroads: Volume III," author and historian Mike Schafer notes that to procure further funding and interest the Southwest Branch of the Pacific Railroad was incorporated for the purpose of opening a southwestern corridor from Franklin to Rolla. It is here where the Frisco's story begins. Construction was launched on July 19, 1853 but required upwards of seven years before the line was finally completed in 1860. Before further work could be undertaken the country was plunged into the Civil War. Damage sustained during the conflict, coupled with further financial difficulties, placed the entire PR system under Missouri state control in February of 1866. A few months later, in June of 1866, the original Pacific Railroad between St. Louis and Kansas City was sold while the Southwest Branch fell into the hands of General John Fremont. Over the years he had been involved with numerous projects and renamed his latest investment as the Southwest Pacific Railroad with continued aspirations of reaching San Francisco. The general's grand ambitions lacked any strong financial backing, however, and he was never able to build beyond Rolla. The property was subsequently reacquired by the state in June of 1867 whereupon it became the South Pacific Railroad in May of 1868. Under this latest incarnation the system maintained transcontinental intentions as rails were extended from Rolla to Springfield with grading completed as far as Seneca. Before further work could be undertaken monetary shortfalls led to yet another name change in 1870 as the Atlantic & Pacific Railway. The A&P remained focused on the west coast although, despite its grandiose name, was primarily interested in a western route from Springfield only. 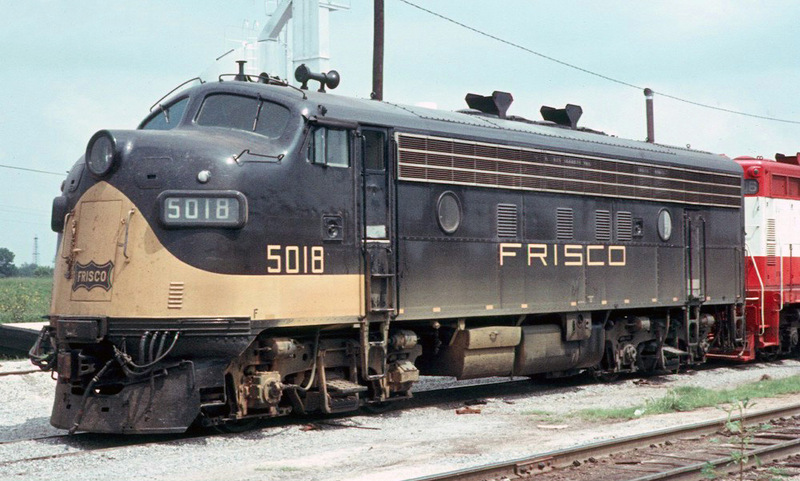 Arguably the Frisco's most identifiable feature was its unique logo. The railroad remained true to its Ozark Mountain heritage and paid homage to such through its iconic emblem. In Mr. Collias's book he relates the story, handed down through the company, which led to its creation: "As related by the company, the station agent at Neosho, Missouri, in 1900 augmented his income by trapping and skinning raccoons and selling the pelts. His practice was to tack hides up to dry on the west end of the depot building. One day, after an obviously successful evening of hunting, the private car of Vice-President G.H. Nettleton rolled into the station in full view of the coonskins tacked up to dry. When Mr. Nettleton inquired about the use of company property for hide tanning, the station agent replied that it was very hard to support a family on his salary of $1.25 for a ten-hour work day and his supplemental income was a must. Then Nettleton asked, somewhat accusingly, 'Don't you know railroading comes first? ', and then grinned and said, 'Well, a hobby is different, how much for one of those coonskins?' Following an exchange of two dollars, Mt. Nettleton reboarded his private car with the coonskin, leaving a puzzled station agent behind. Shortly thereafter a drawing indicative of a tightly stretched coonskin with the word FRISCO enclosed within its boundaries appeared in the corporate office and the Frisco trademark was born." Despite Fremont's lack of success he was able to secure roughly one million acres in federal land grants, which greatly aided the A&P's efforts. By 1870 the railroad was operating a continuous, 300-mile corridor from Pacific, Missouri to Vinita, Indian Territory (later Oklahoma). It had began efforts on a disconnected western segment between Isleta, New Mexico and Needles, California before financial struggles arose and the company slipped into bankruptcy once again on October 30, 1875. What followed was a complicated corporate shakeup. At that time the A&P controlled not only the previously mentioned trackage but also the original Pacific Railroad (reorganized as the Missouri Pacific Railway in 1872) main line between St. Louis and Kansas City. On September 11, 1876 the St. Louis & San Francisco Railway was incorporated for the purpose of acquiring the A&P's assets between Pacific-Vinita while the newly formed Missouri Pacific would pick up the St. Louis-Kansas City corridor. With now entirely separate managements, the StL&SF no longer had a direct entry into St. Louis. For some time it utilized MP trackage rights but the high rental charges of this affair led to the opening of its own line in 1883. Oklahoman: Originally connected Kansas City and Tulsa and later served St. Louis and Oklahoma City. During the 1880's StL&SF established routes throughout the southern Midwest as it continued to work on a California extension. This new trackage included Pierce City, Missouri - Wichita, Kansas (originally finished in 1880 it was pushed west to Ellsworth in 1888 for a connection with Union Pacific); an extension of the main line to Sapulpa, via Tulsa, by 1886; and finally a branch from Monett, Missouri to Paris, Texas (completed in 1887 it opened an interchange with the Gulf, Colorado & Santa Fe, a Santa Fe subsidiary). By 1890 it boasted a network of 1,800 miles. Unfortunately, hopes of reaching the west coast were eventually dashed. According to Keith Bryant, Jr.'s book, "History of the Atchison, Topeka, and Santa Fe Railway," the new Frisco intended to establish a California corridor by working in conjunction with the Santa Fe. The much larger railroad would be used from a connection at Wichita to Albuquerque where the StL&SF would then use its new line as far west as Needles and a Southern Pacific interchange. The AT&SF realized the potential danger of this new threat and worked out a comprise with Frisco officials. What was known as the Tripartite Agreement was signed by both parties on November 14, 1879 which essentially gave Santa Fe total control of the railroad and A&P charter into California. Things remained this way until the financial Panic of 1893 forced the Frisco back into receivership. It emerged in June of 1896 as the St. Louis-San Francisco Railroad and free of Santa Fe's influence. Once independent the railroad began another round of rapid expansion as it centered on a Midwestern network only: its main line was extended west of Sapulpa to Oklahoma City in 1898 and finally Altus, Oklahoma in 1903 (In 1909 it gained control of the Quanah, Acme & Pacific which extended this western terminus to Floydada, Texas. For many years the location was an important interchange with the Santa Fe. ); south of Sapulpa service opened to Denison, Texas in 1901; it gained access to Carrolton by purchasing the small Red River, Texas & Southern Railway while trackage rights over the St. Louis Southwestern and Chicago, Rock Island & Pacific (Rock Island) provided access into Dallas/Fort Worth; in 1898 it first reached Kansas City on a new corridor built as the Kansas City, Osceola & Southern (later nicknamed the "High Line") from Springfield, Missouri via Clinton and Osceola; it completed an east-west branch between Ardmore, Oklahoma and Hope, Arknasas in 1903 (built as the St. Louis, San Francisco & New Orleans); lastly, four years later a new branch opened between Beaumont, Kansas and Vernon, Texas which linked Wichita with its Altus line. Its largest single acquisition was the 1901 lease of the Kansas City, Fort Scott & Memphis Railway (KCFtS&M) which joined Kansas City with Baxter Springs, Kansas (a connection later opened between Baxter Springs and Frisco's main line at Afton, Oklahoma). In turn, the KCFtS&M also controlled the Kansas City, Springfield & Memphis (Springfield-Memphis, Tennessee) as well as the Kansas City, Memphis & Birmingham (Memphis-Birmingham, Alabama). Another interesting subsidiary was the Kansas City, Clinton & Springfield which roughly paralleled the "High Line" between Springfield and Kansas City albeit over a less noteworthy route. It was notoriously referred to as the "Leaky Roof" and before its abandonment offered the Frisco one of three different options into Kansas City (the other running between Springfield and Fort Scott). Expansion also took place in the east where a north-south bridge line opened between St. Louis-Memphis while purchase of the Gulf Coast Lines (GSL) provided access into that region. The former was built as the St. Louis, Memphis & Southeastern, opening in 1904 as far as Marion, Arkansas (along the Memphis - Springfield main line). By acquiring the GSL the Frisco gained a route between New Orleans and Brownsville via Houston. This late-era growth was all thanks to the Reid-Moore Syndicate which took control of the Frisco in 1903. The speculators also acquired the Rock Island, Chicago & Eastern Illinois, and Fort Worth & Rio Grande (It was added in 1901, running between Fort Worth and Brady, Texas. The system was later sold to the Santa Fe in 1937.) in a grand attempt to establish a powerful transcontinental railroad. Their efforts ballooned Frisco's network to 5,260 miles but it came at great cost as the syndicate overextended their finances. The incredibly complex and expensive boondoggle ultimately failed, resulting in the Frisco bankruptcy in 1913. It emerged on June 19, 1916 as the St. Louis-San Francisco Railway but was separated from both the C&EI and GSL (the C&EI became independent once more while the Gulf Coast Lines were later picked up by Missouri Pacific). Better days were in store as Frisco began upgrading infrastructure to position itself as a strong regional carrier. Its final noteworthy expansion took place in July of 1925 by acquiring the 142-mile Muscle Shoals, Birmingham & Pensacola running between Kimbrough, Alabama and Pensacola, Florida. The move reestablished service to the Gulf Coast and the railroad hurriedly completed a 152-mile link from Kimbrough to Aberdeen, Mississippi (opened on June 27, 1928). Two decades later it gained another Gulf Coast route by purchasing the Alabama, Tennessee & Northern (operating between Reform and Mobile, Alabama) on December 28, 1948. The 1920s were generally good with a strengthening freight business and further property upgrades through the installation of centralized traffic control and fleet of high quality/rebuilt locomotives (thanks to its West Springfield Shops). Attention to its physical plant would pay off when the Great Depression brought about bankruptcy on November 1, 1932. As traffic and the economy slowly recovered the Frisco's well-maintained property was ready for the onslaught of business during World War II. It handled a record 9.4 billion ton-miles in 1944 and the brisk traffic brought an end to receivership in January of 1947. The company's final thirty years were its best thanks to a growing petrochemical industry along the Gulf Coast. It also diversified into other traffic such as zinc, paper, automobile components, and general merchandise. 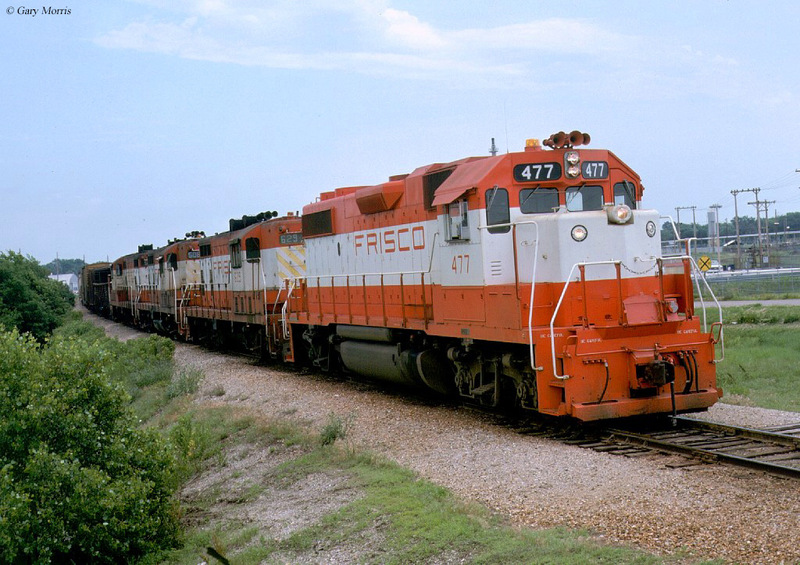 The Frisco became well-known at this time for providing reliable, high-speed service over its 5,100-mile network. As upgrades continued during its latter years key portions of its main arteries were double-tracked while CTC-protected territory was extended. * #812-815 were ex-demonstrators #51-54. * Many of these Pacifics were rebuilt by Frisco's West Springfield Shops between 1936 and 1943. ** Rebuilt by the West Springfield Shops from former 2-10-2's. Thanks to author Joe Collias's book "Frisco Power: Locomotives And Trains Of The St. Louis-San Francisco Railway, 1903-1953," for help with much of the above roster information. 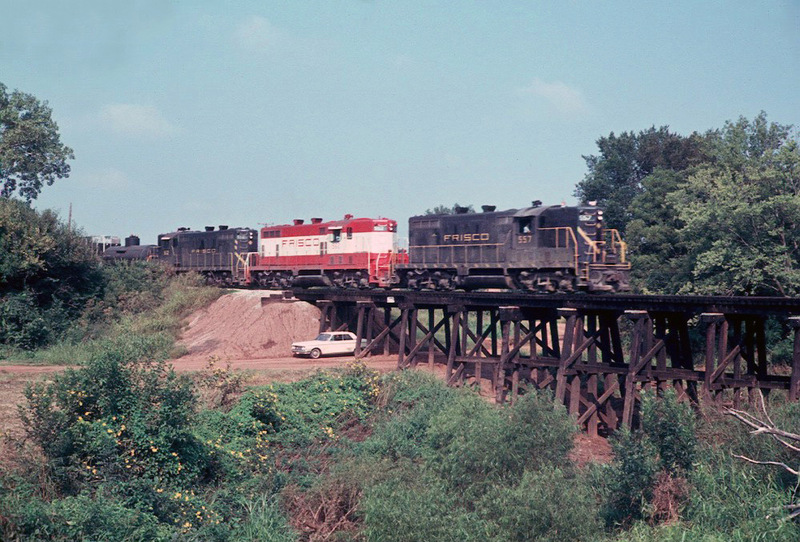 It opened a high tech “hump” yard in Memphis (whereby an inclined track and computer-controlled switches guided cars into their correct staging track), streamlined/consolidated operations wherever possible, initiated run-through freights with other carriers ("pooling), and was successful in petitioning the Interstate Commerce Commission to eliminate remaining passenger services entirely on December 8, 1967 with the Southland's termination. This process had been launched nearly a decade earlier when on January 5, 1959 the Texas Special was discontinued. The once-glamorous streamliner was a joint service with the Missouri-Kansas-Texas Railroad but the Katy's declining physical plant and shoddy equipment irritated Frisco management, leading to the train's cancellation. In 1965 it attempted to discontinue remaining services but was initially denied by the ICC. With $7 million in losses annually, however, it persisted until winning approval two years later, making it the largest freight-only railroad up to that time. 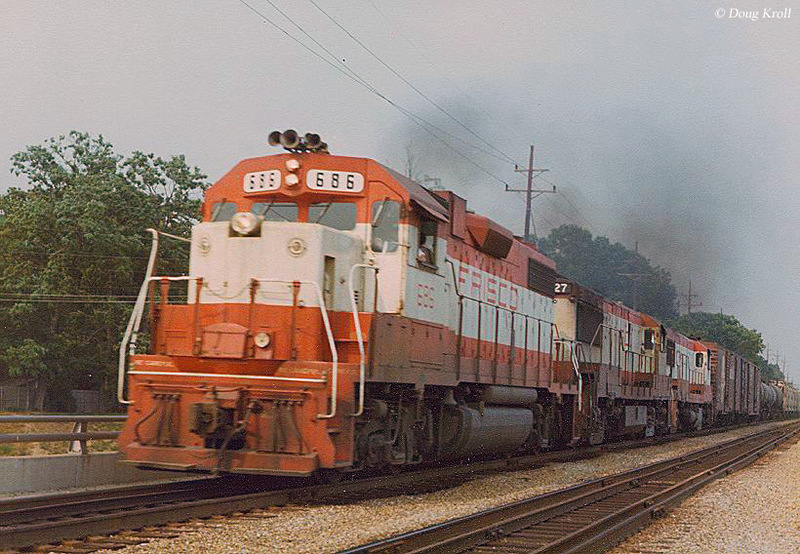 By the 1970's the St. Louis-San Francisco Railway had transformed itself into a very attractive property and caught the eye of the much larger Burlington Northern, which formally acquired the road on June 8, 1981.